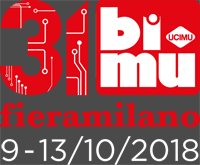 GREAT SUCCESS FOR 31.BI-MU/SFORTEC INDUSTRY 65,000 VISITS TO THE EXHIBITION THAT ENJOYED THE FULL APPRECIATION OF EXHIBITORS. ALLMAG | Supermarket and ergonomics: more options as Lean solutions! MÉCANUMÉRIC | Two stands and two exclusive previews! Press Release, Cinisello Balsamo, 2 luglio 2018. Press Release, Cinisello Balsamo, 20 december 2017.